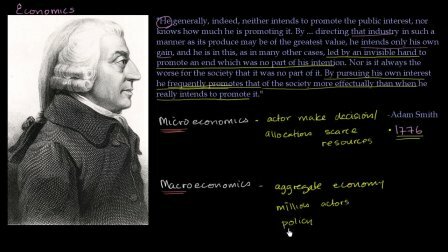 Basic introduction to what microeconomics and macroeconomics study. A bit on Adam Smith. GDP is an indicator of a society’s standard of living, but it is only a rough indicator because it does not directly account for leisure, environmental quality, levels of health and education, activities conducted outside the market, changes in inequality of income, increases in variety, increases in technology, or the—positive or negative—value that society may place on certain types of output. The standard of living is all elements that affect people’s happiness, whether these elements are bought and sold in the market or not.